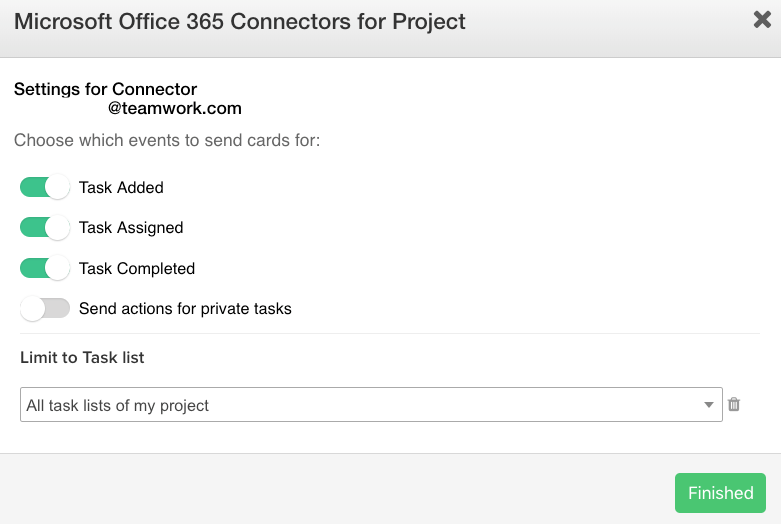 Within Teamwork Projects, you can integrate with Microsoft 365 connectors so that you can interact with your projects via Outlook 365. The integration will send you interactive email notifications known as actionable messages. From these, you will be able to edit task elements such as due date, board column, assigned people, and completing the task. Note: Microsoft Office 365 Connector is available on the Premium plan and higher. Enabling the integration has to be done first at a site level via the integrations section of your site settings. You will see a section for Microsoft Office 365 Connectors, and an option to enable. Once set up at site level, you will need to configure the connectors at project level, in the project's integration settings. In the connectors modal, select Connect to Office 365 to sign in with your Office 365 credentials. Note: In order to use the connectors, you will first need to set up at least one Office 365 Group in your account. Once you click connect, you can choose which of your existing Groups to use for the connection. You can also edit your existing connections by clicking the edit button to the right. 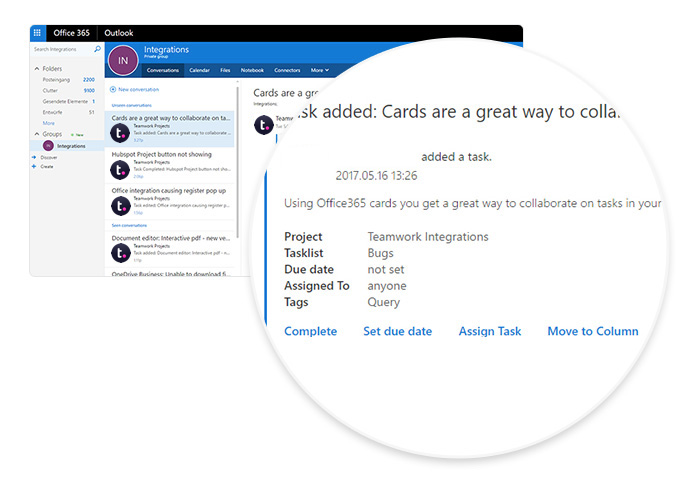 In the modal, you will be able to choose which Teamwork Projects events send cards and whether you want to limit it to a specific task list. When everything is set up in your Groups section of Office 365, you will see Actionable Messages that will allow you to make changes to Teamwork Projects directly in your Office 365 browser window.